Amanda Faber reminisces about her days as a barista to create a warm-beverage flavor in her Peppermint "Hot" Chocolate Cake for the "Finals Week" Showstopper Bake. Working as a barista gave her joy when she watched patrons fill up on whatever warm drink they ordered during cold days, and she's hoping those warm feelings translate into the decadent cake she created for the judges this week. 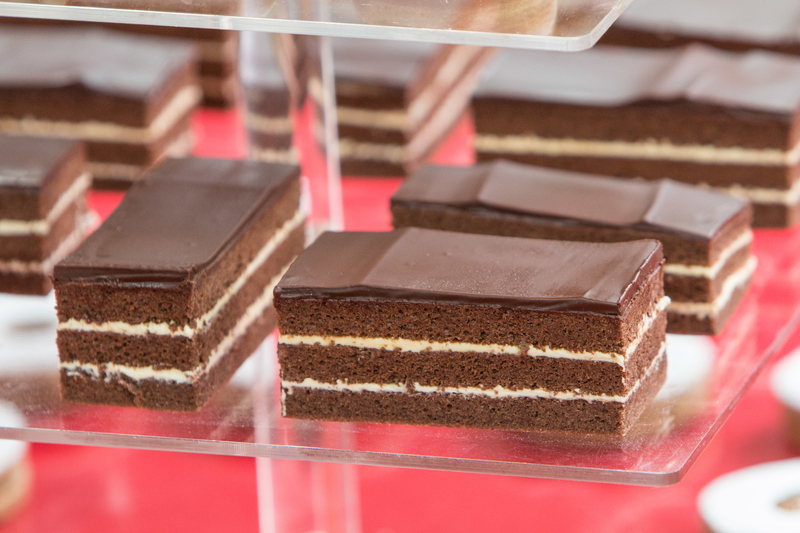 The final creation is made with layers of chocolate jaconde cake and a peppermint buttercream filling, topped with a thin layer of chocolate glaze. Watch the full episode of "Finals Week" from The Great American Baking Show Season 2 episode 8. 2. In a stand mixer fitted with a paddle attachment, combine the almond flour, confectioners sugar, flour, and cocoa. 7. Using a scale with a bowl on top divided batter evenly among 3 sheet pans. Spread with off-set spatula to smooth. 8. Bake one at a time for ~7 minutes. 10. Invert the cake on to a large cutting board covered with a piece of parchment paper. Cool. 1. In a heavy-bottomed sauce pan over high heat, boil the water and sugar until 238° F/114° C.
2. In a stand mixer fitted with a whisk attachment, beat the egg yolks for one minute. 3. Once the sugar has reached the proper temperature, stream it in to the stand mixer with eggs while it is running. 4. Beat until completely cooled, 5-7 minutes. 5. Beat in the butter little by little until thick and smooth. 6. Add in the peppermint extract. 1. Over a bain-marie, gently melt the butter and 170g of the chocolate. Stir constantly to keep an even temperature. 2. Once melted and smooth, stir in the remaining 30g of chocolate. 3. Cool until room temperature but still liquid. Reheat if necessary. 1. In a heavy-bottomed saucepan over a medium-high heat, stir the cocoa powder, water, and sugar until the sugar is dissolved. 2. Stir in the vanilla extract, chocolate extract, and heavy whipping cream. 1. Assembly the cake on a large cutting board. 2. Soak the first cake with the chocolate milk soak. Cover with a thin layer of buttercream. Repeat with remain two layers. The top layer of buttercream should be very, very thin. You should see the cake through it in all places. It's only there to make it smooth. 3. Pour on the chocolate glaze. Spread it to be smooth. It's okay if it runs off. 4. Chill the cake for ~10-15 minutes. 5. Cut in to 12 equal pieces, probably about 4x1.5 inches. 6. Garnish each cake bar with a marshmallow and a mint leaf.